Today i'm gonna show you, how your could define your build strategies in android studio in an elegant, enhanceable way using the strategy design pattern. Most of the times, Google defines its product making usage of best practises and good, enhanceable design pattern. I saw recently, in a big project we got, that they were not taking advantage of this and instead of that, they were using enumerations, resulting in a bunch of switch cases and later on another bunch of if-else cases and a lot of repeated code that breaks the DRY-principle and even more important the open-close-principle. What does it mean to be programming respecting the open-close-principle? It means that every time a new component is created, that i don't have to change running code. i.e. I don't have to create another enum type, another switch-case to identify this type and later on another if-else case to know, depending on the comparation result, what kind of environment i want to set. That's the code we got. This code has a lot of problems. It is fragile. Every new environment forces you to change a chain of steps in the code. Further it forces you to hold 4 variables in a static way to be able to share it over the application instead of hold only one object responsible for that. We define new enum types and define a new if statement running the risk of breaking existing logic. All of this can be avoided using the strategy pattern. The code above is functional but when it comes to enhancement, maintainability and so on, then we can see some problems on that. We will discuss this later on. Let's now see how we could do it better by using the strategy pattern. First have a look at the uml diagram of it. * and select "Build Variant > debug" while developing the application. * Build environment strategy - Every environment phase should extend from this strategy. Coming back to our initial discussion. Imagine now you need to add a new enviromnet. lets say staging. 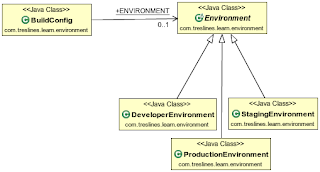 with the approach above you just have to say to someone: create a class who extends from environment, analogical DeveloperEnvironment, define it in your build.gradle, like you would do for the other approach also and done! It would work just fine without touching already written, functional code.The other way around you would have to change the enum, change the if-else statements. 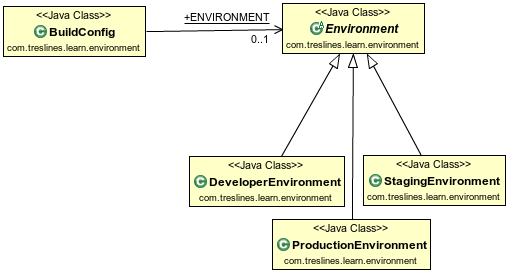 buildConfigField "com.treslines.learn.environment.Environment", "ENVIRONMENT", "new com.treslines.learn.environment.DeveloperEnvironment()"
buildConfigField "com.treslines.learn.environment.Environment", "ENVIRONMENT", "new com.treslines.learn.environment.StagingEnrivornment()"
buildConfigField "com.treslines.learn.environment.Environment", "ENVIRONMENT", "new com.treslines.learn.environment.ProductionEnrivornment()"